As wedding photographer, I learned early in my career that one has to take beautiful pictures of the bridal shoes, the wedding dress, the garter, the perfume the wedding invitations not to mention the rings and the headpiece in order to please the couple. At this beautiful wedding at Château Le Parc, I was fortunate enough to have access the whole venue is the couple will both ballroom A and ballroom B for the special event. As such, I had no problem moving around the venue and photographing it any place I wanted. This particular shot was captured on the stairs. Whenever possible, I try to avoid handling such important items like the dress, the cake and so on. As such, I asked the maid of honour to help me arrange the dress and she was happy to oblige. For this photograph, I asked my second shooter to hold a flash to camera right so it gives the image depth. This is an asymmetrical composition as I placed the dress on the right hand side of the frame. To balance it visually, I included the lighting fixture in the image. That gives the photograph stability and makes it more interesting. 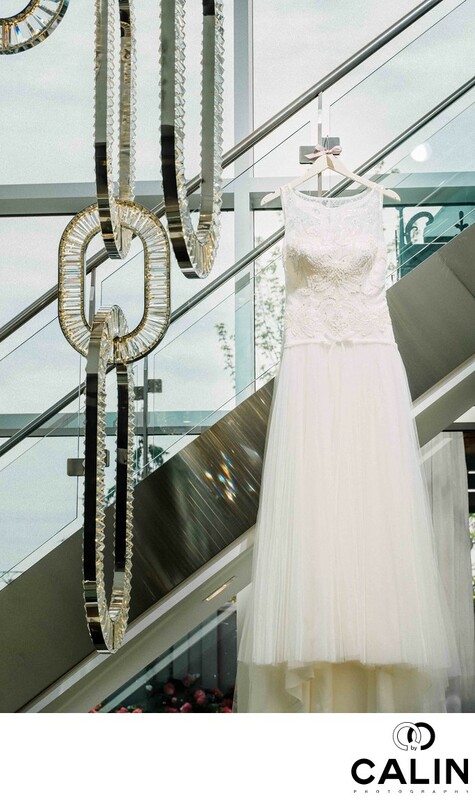 The stairs behind the dress create a diagonal that forms a leading line. That gives the photo dynamism and makes the dress "pop".